When looking for an online casino to play at, it can be difficult to find the best choice for you. 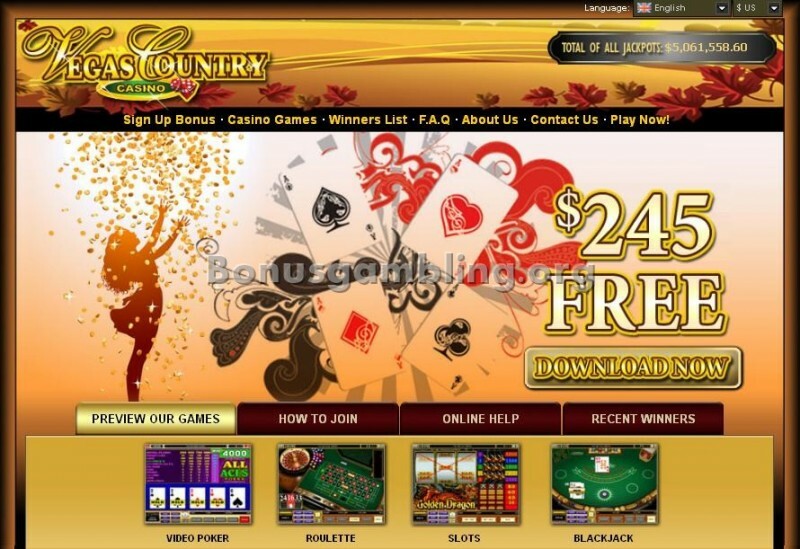 Vegas Country Casino offers everything you are looking for in an online casino experience. With a wide range of games, multiple bonuses and promotions, 24/7 customer support, multiple banking methods and top software features, Vegas Country Casino is worth a visit. The warm, rich colors and crisp, clear graphics of the home page will immediately attract you to the casino site. All the information you may be looking for is instantly available or only a click away. The site is easy to navigate around and all links are accessible on the well-laid out home page. Vegas Country Casino is powered by the leading online casino software developer, Microgaming. The software is available in a download version and a no download Flash version, making it accessible to PC and Mac players. The features and functions available at the site live up to Microgaming’s reputation. The software supports play in multiple languages including English and Italian, as well as multiple currencies including USD, EUR, GBP and CAD. In addition, it features impressive graphics and animations, as well as excellent sound effects. Vegas Country Casino offers a large suite of more than 470 games. These include table games, card games, video poker, slots and progressive games. Popular game titles include blackjack, roulette, craps, baccarat, Caribbean draw poker, casino war, sic bo, Texas hold’em and plenty more. Games can be played for free in the fun mode of the casino or for real money in the real money mode of the casino. There are also 16 progressive jackpot games, including a range of slots games, plus Caribbean draw poker and video poker games. Vegas Country Casino offers 24/7 customer service support. A customer support representative is available to take your questions at any time of the day or night. They can be reached via email, telephone or instant live chat. There are toll free telephone numbers available from Germany, the UK, Canada and Denmark. There is also a comprehensive FAQ section on the website that may answer your questions. Vegas Country Casino makes every effort to protect your personal and financial information. All transactions are secured via 128-bit SSL data encryption technology. The casino is also a member of the Interactive Gaming Council and is certified by eCOGRA for fairness. Vegas Country Casino is licensed by the Kahnawake Gaming Commission. It does not accept US players.